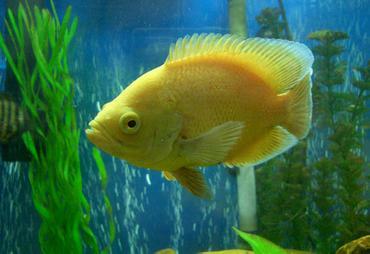 Fish can be found in a variety of environments all over the world -- live in oceans, lakes, ponds, and rivers. 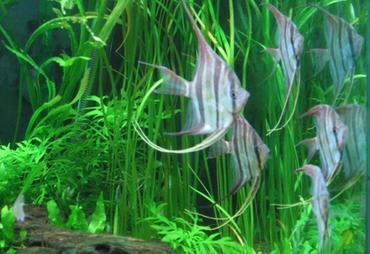 These bodies of water all have large surface areas and often strong current which keep the water moving. 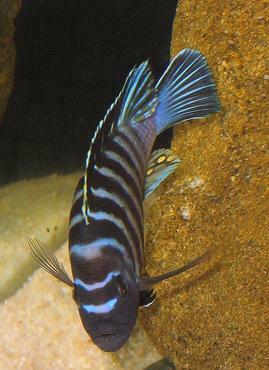 Water movement and circulation serves to oxygenate the water so that fish have the air they need to breathe and survive. 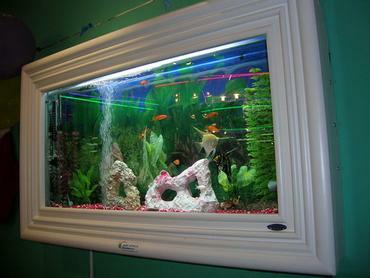 However, in an aquarium, the surface of the water is greatly reduced. 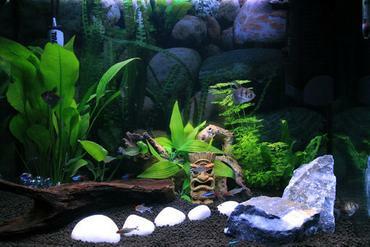 Therefore, artificial ways of oxygenating the water must be accomplished through aeration. 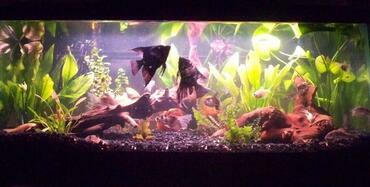 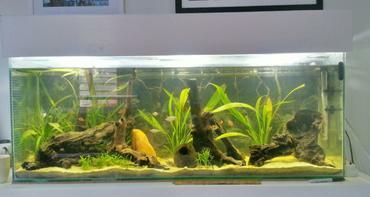 There are several ways to aerate your aquarium and these methods will be discussed in this article. 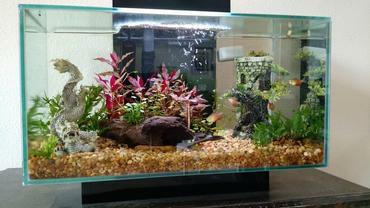 Before discussing specific methods, it is important to address the surface area of the water in your aquarium. 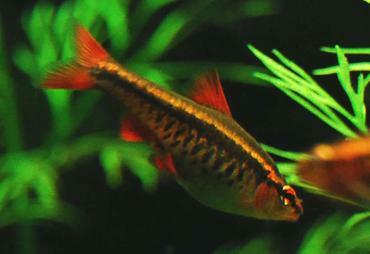 The greater this surface area is, the more water that is in contact with the air at any given moment. 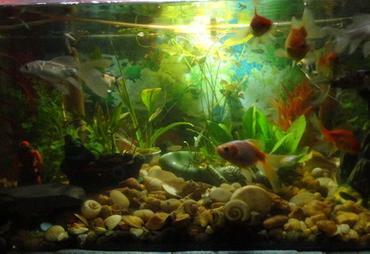 This leads to greater oxygen absorption by the water. 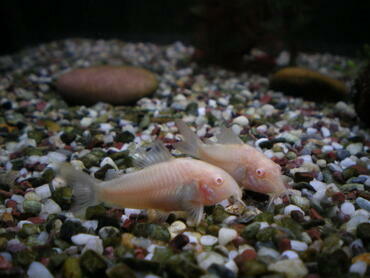 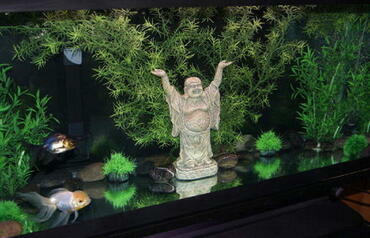 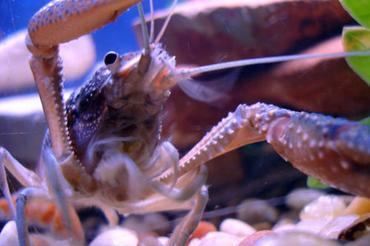 Therefore, you should try to maximize the surface area in your aquarium. 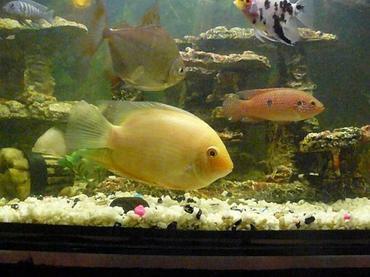 This issue is particularly important to consider when you are thinking about the shape of a tank – standard tanks are rectangular with a greater width than height but some tanks come in “tall” sizes with walls that are taller than they are wide. 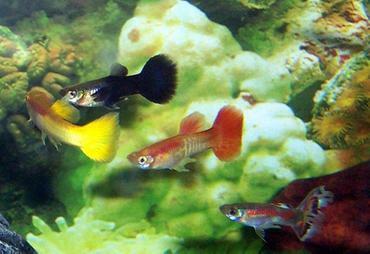 Many people mistakenly assume that you can keep the same number of fish in a 20-gallon standard tank as you can in a 20-gallon tall tank. 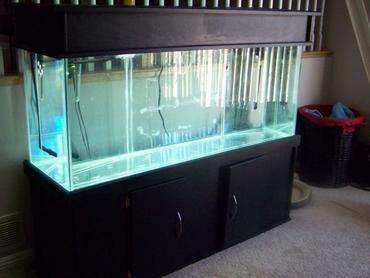 However, the 20-gallon standard tank actually has a larger surface area due to its length and width dimensions. 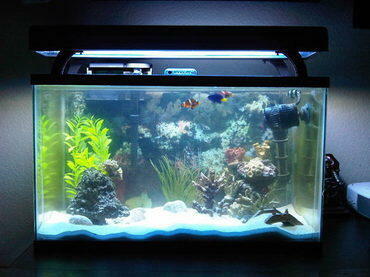 You need to be careful with tall tanks or irregularly-shaped tanks (such as hexagons), as the water surface can be fairly small. 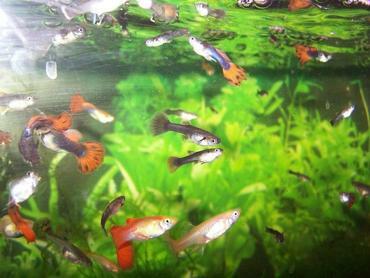 This smaller surface limits the stocking capacity of the aquarium. 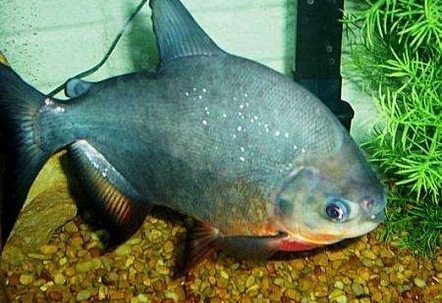 As your fish breathe, they absorb oxygen from the tank water and their bodies convert it into carbon dioxide which is then exhaled. 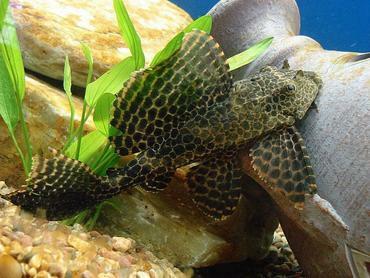 Oxygen and carbon dioxide are also exchanged at the water’s surface -- carbon dioxide is released from the water into the air. 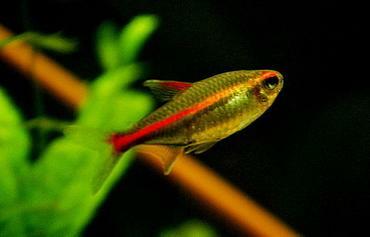 This is important because your fish would die if the CO2 was never allowed to escape into the atmosphere – it would simply build up in the tank, causing your fish to slowly suffocate. 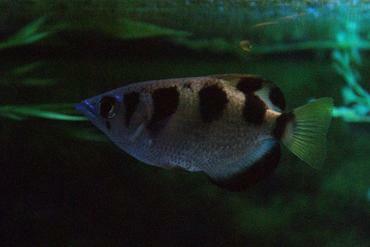 While CO2 is being released from the water into the air, oxygen is also being absorbed from the air into the water. 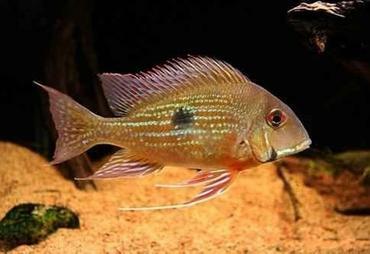 This is important because it increased the oxygen content of your tank water, providing the oxygen your fish need to breathe. 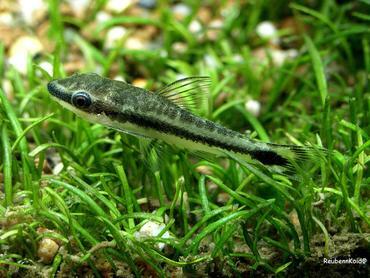 For this gas exchange to occur, however, the surface tension of the water must be broken – this allows for carbon dioxide molecules to be released and oxygen to be absorbed. 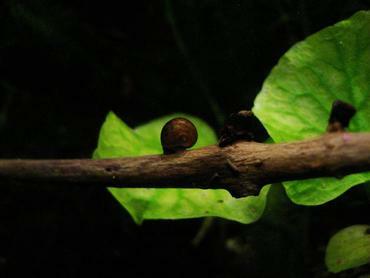 Agitating the surface breaks this surface tension and allows for a proper exchange of gases. 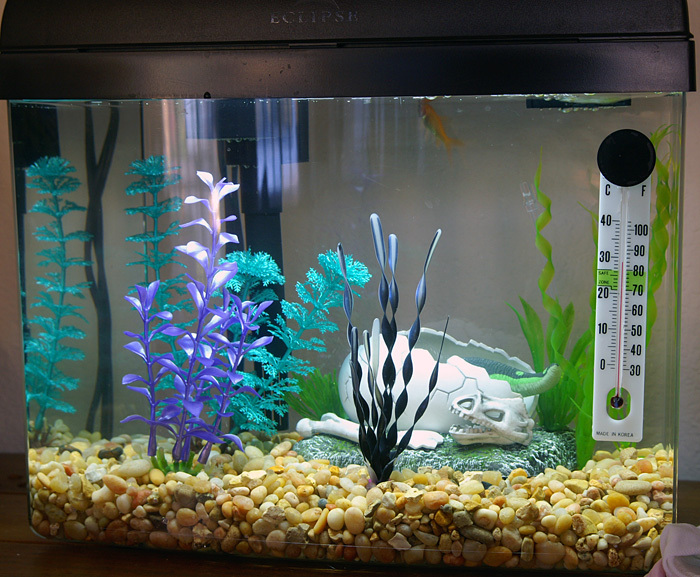 As the temperature of your aquarium increases, the oxygen content in it decreases because the evaporation rate of your tank water will be higher. 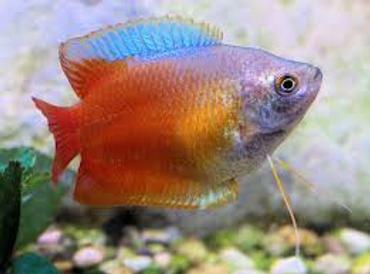 Therefore, the higher you keep your tank’s temperature, the more aware you need to be of whether or not your fish are getting enough oxygen. 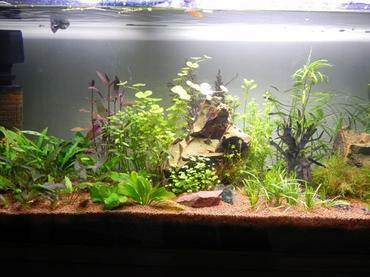 Once you get above 800 F, you will probably have to provide some of the aeration devices listed below in addition to your filter. For many aquariums, a simple HOB (hang on back) filter will adequately aerate your tank. 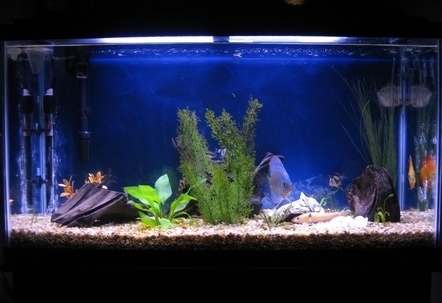 Many filters have outputs that drop the water into the surface of the tank and, therefore, provide adequate surface agitation. 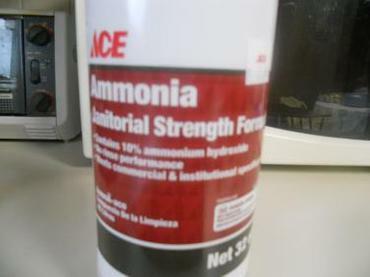 This surface disturbance increases the surface area in contact with the atmosphere and, therefore, increases oxygen absorption. 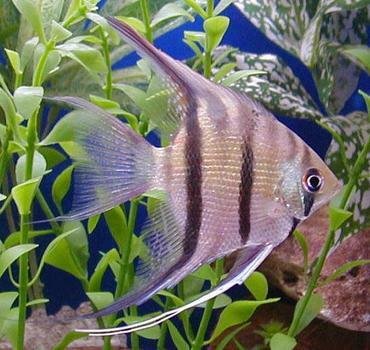 Additionally, the filter circulates the water in your tank which is important because it moves the water at the bottom of your aquarium (water that is not gaining oxygen from the air) to the top surface so it can increase its oxygen concentration. 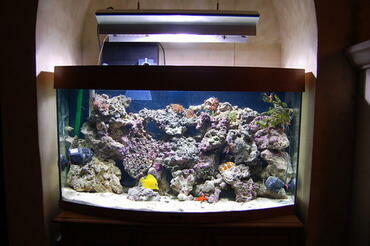 If your filter is not disturbing the surface enough or providing enough circulation, you can use a power head as well. 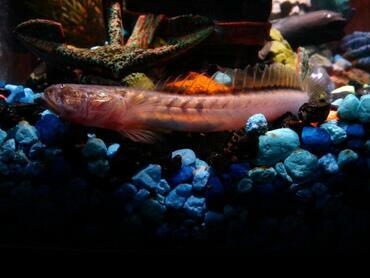 A power head siphons water up out of the tank and mixes it with air as it is expelled. 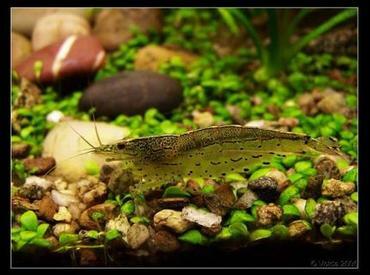 Many power heads also let you adjust how much air they intake which enables you to adjust how many bubbles are produced (see the paragraph on air stones below to see how bubbles help in aeration). 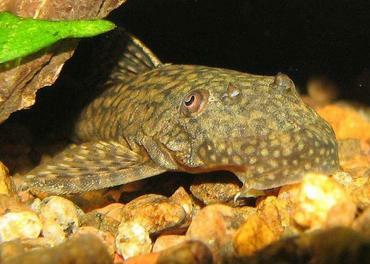 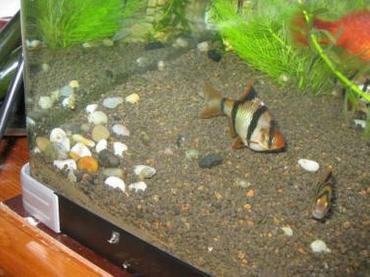 Power heads can also be useful in eliminating dead spots in the tank – areas where water circulation is particularly low. 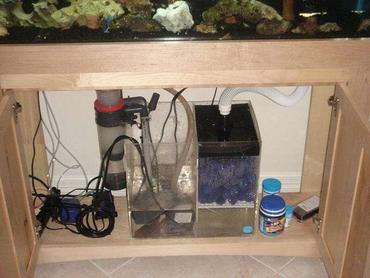 A carefully placed power head can serve to increase the circulation in these areas of your tank. 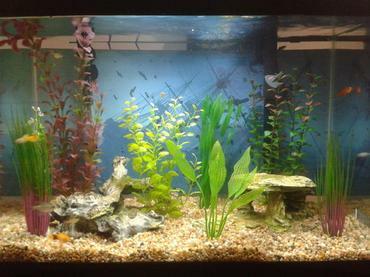 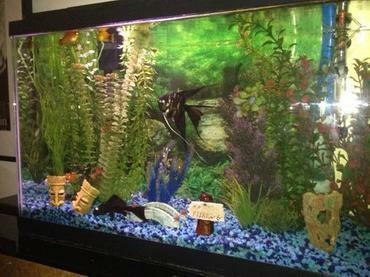 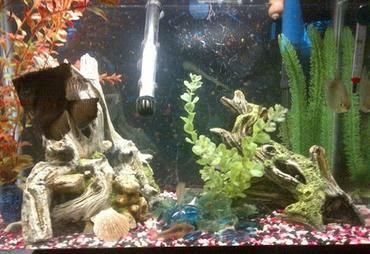 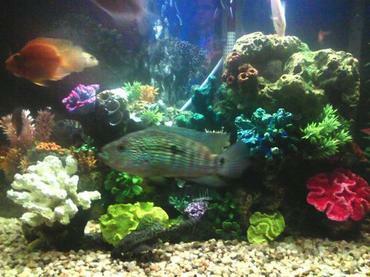 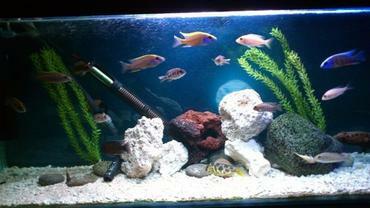 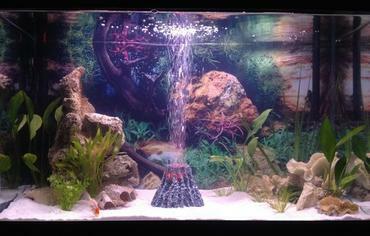 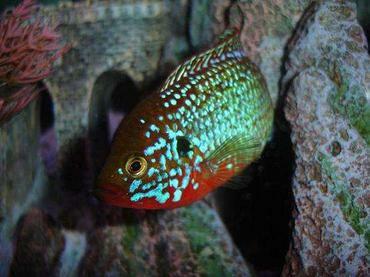 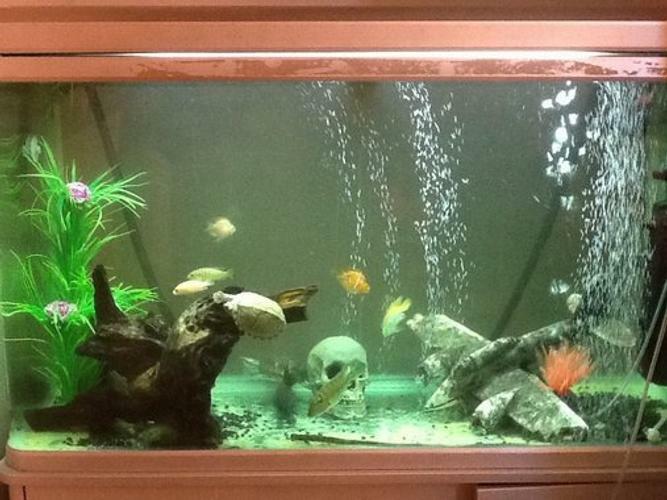 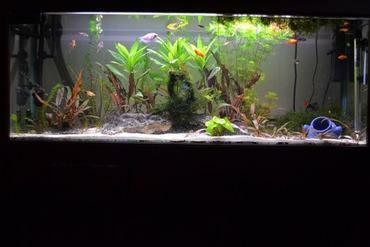 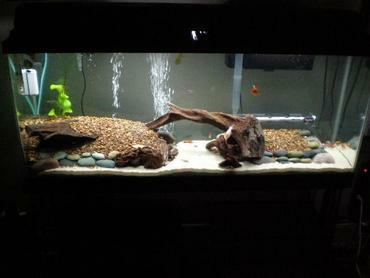 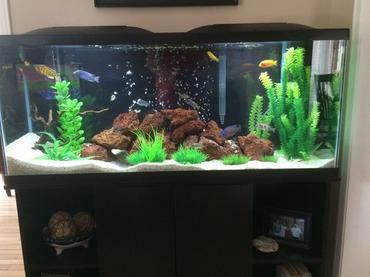 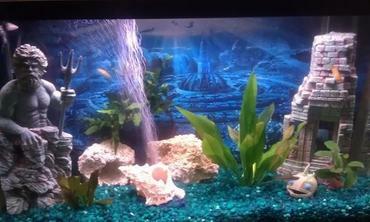 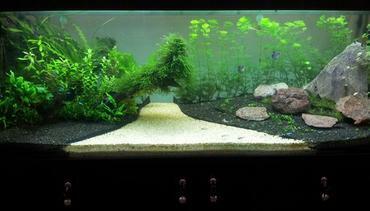 Filters, air stones, and decorations often do not adequately aerate large aquariums. 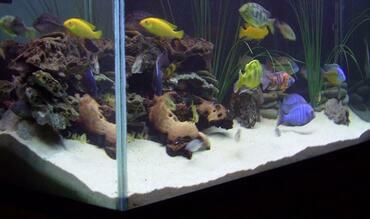 Therefore, power heads are often the preferred method for larger tanks. 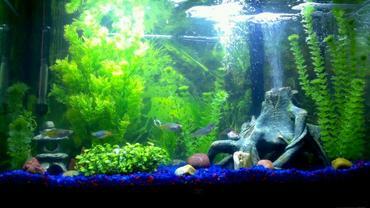 However, you can easily provide too much current in small to medium sized aquarium with power heads, so be sure to buy one rated for smaller tanks or buy one that has an adjustable flow rate. 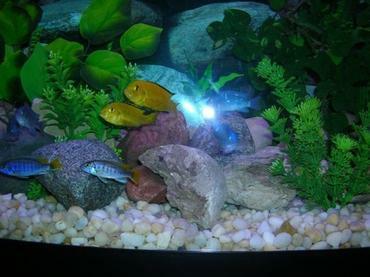 An air stone is a porous stone that is connected to an air pump to produce bubbles in an aquarium. 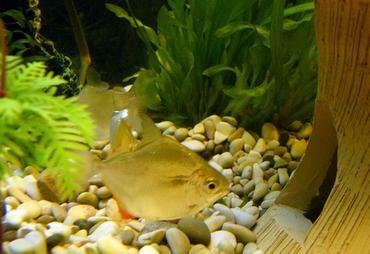 Many think these pumps are too noisy and, therefore, choose not to use air stones. 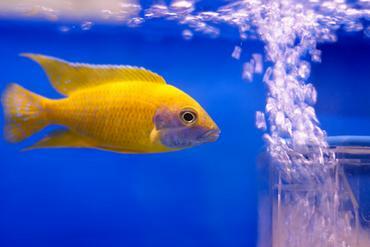 However, placing the pump on a sponge will usually dampen the noise significantly. 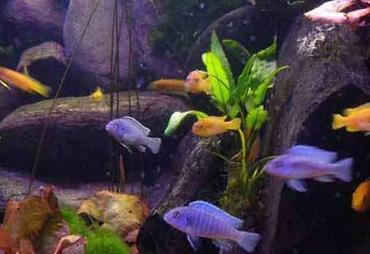 Some hobbyists really like the look of a bubble wall in their aquarium and, therefore, use them even when further aeration is not needed. 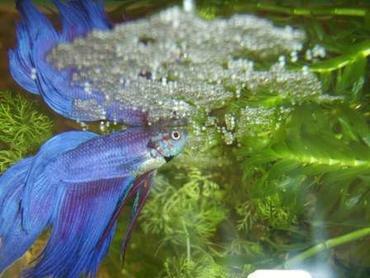 It is not actually the bubbles that provide the oxygen to the water (a common misconception), but it is their disturbance of the surface and ability to provide more water circulation that helps to raise the concentration of oxygen in the tank. 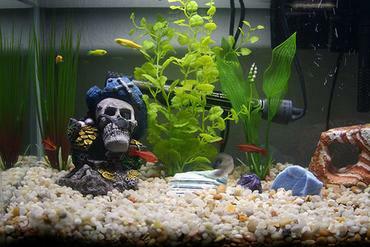 Who doesn’t like a nice pirate ship that moves back and forth while simultaneously producing bubbles? 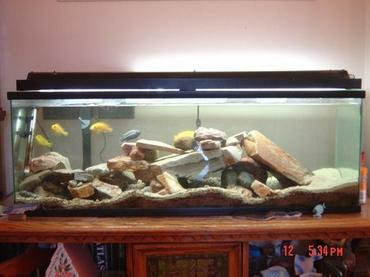 How about a nice treasure chest? 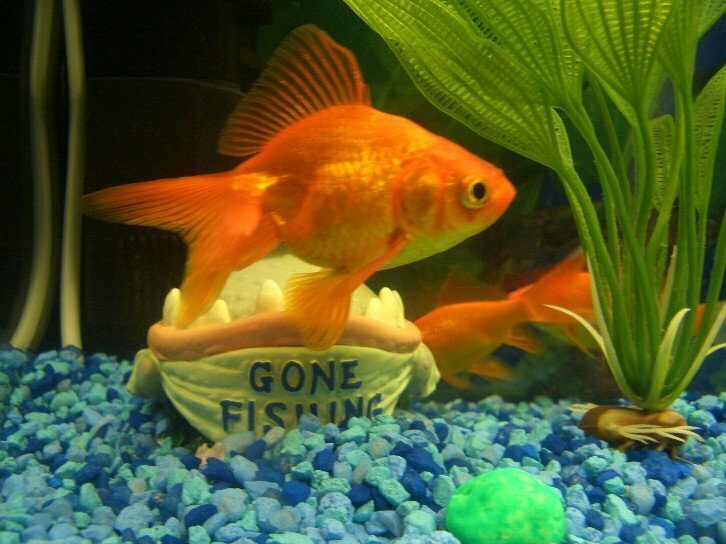 Or a fake shell? 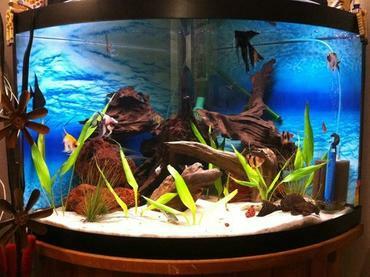 If you don’t like the natural look, but instead love putting these kinds of decorations in your aquarium, they can serve the same purpose as an air stone but with a little more flair. 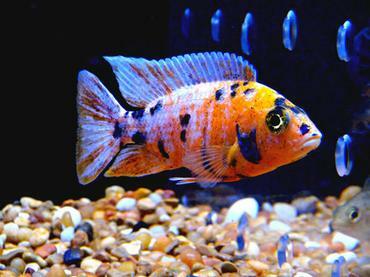 It is sometimes difficult to tell whether you are giving your fish enough oxygen because they might not show any symptoms at first. 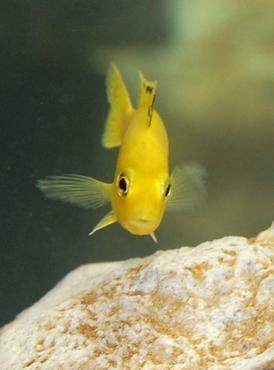 The most telling sign that your fish need more oxygen is if you see them gasping at the surface -- they will also tend to hang out back by the filter output. 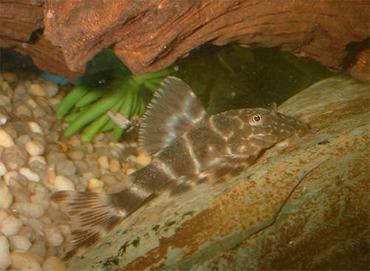 This area of your tank tends to possess the highest oxygen concentration as it is near the most disturbed surface. 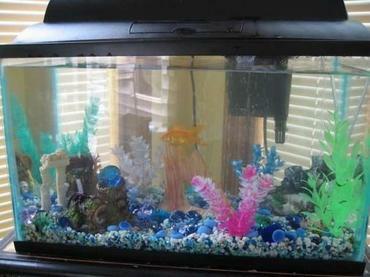 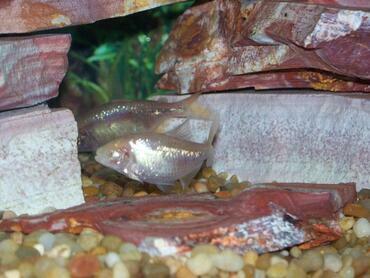 Another indicator is if you see bottom-dwelling fish constantly having to go to the upper part of the aquarium. 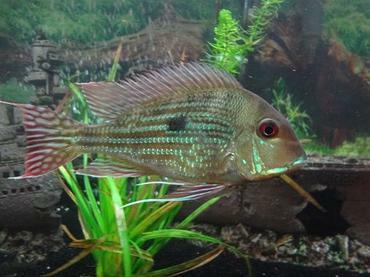 If you see any of these indicators, use one of the methods described above to provide more oxygen to your fish. 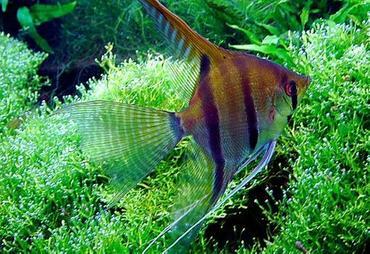 While not having enough oxygen in the tank is the more common problem, you can also provide too much circulation in your aquarium. 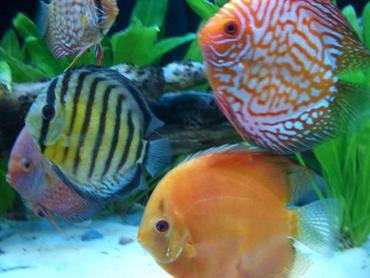 Obviously, if you see your fish being whisked around the aquarium or see them greatly struggling, you need to reduce the amount of circulation. 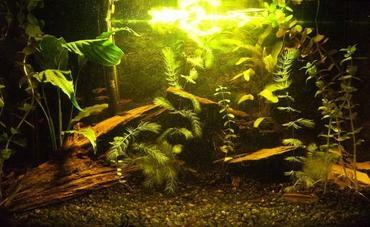 Different species will be able to handle more water movement than others. 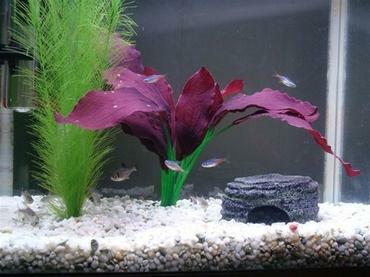 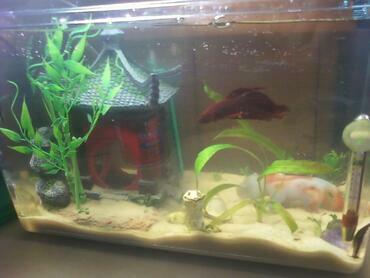 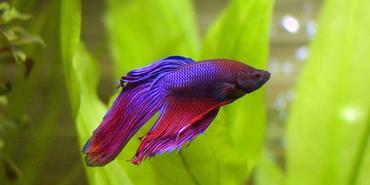 Some fish (such as bettas, for example) prefer very still water so a small amount of current may be too much for them. 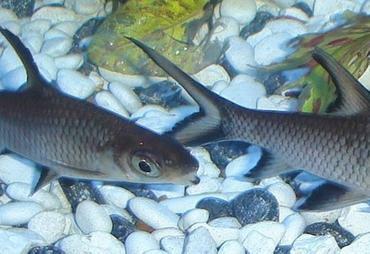 Others actually prefer strong currents to play in. 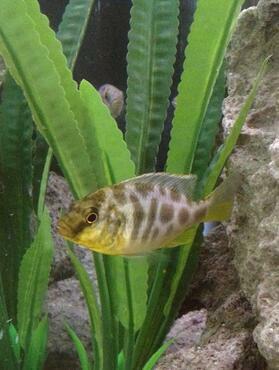 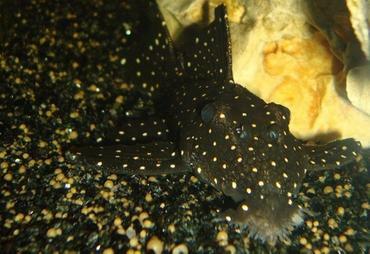 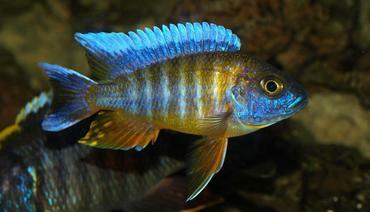 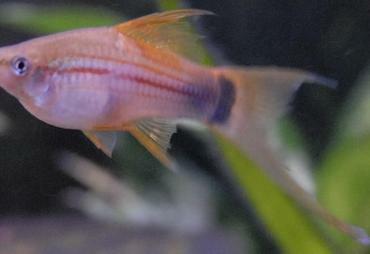 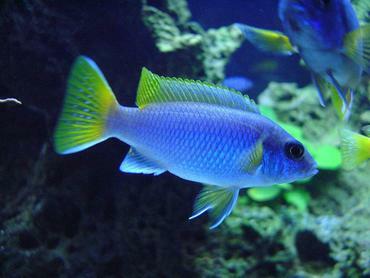 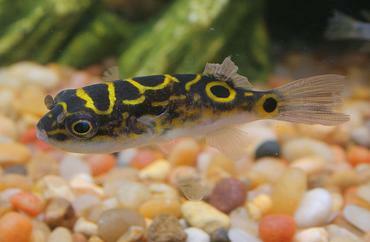 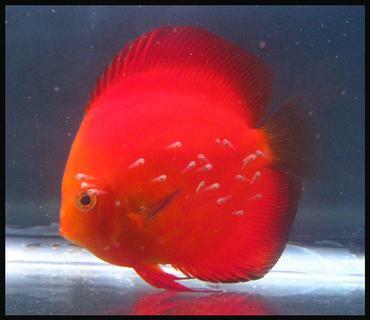 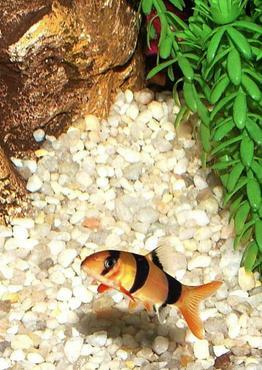 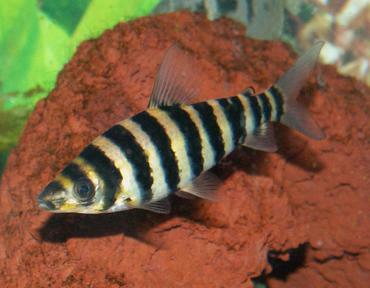 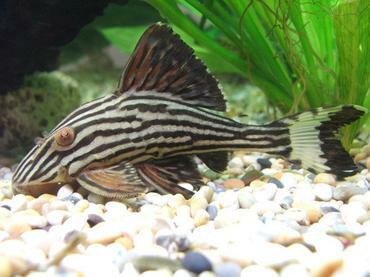 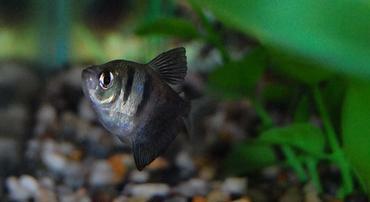 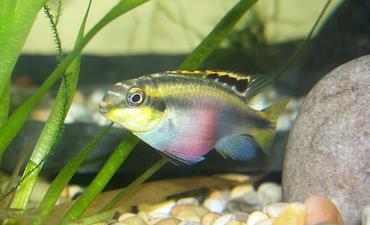 Research your specific fish and observe their behavior to see what they like. 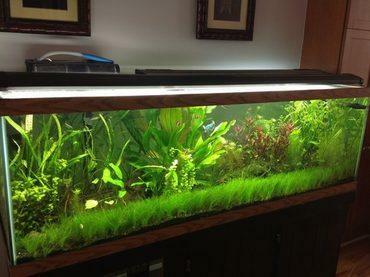 Adding some sort of aeration device to your tank is not the only way to increase its oxygen content. 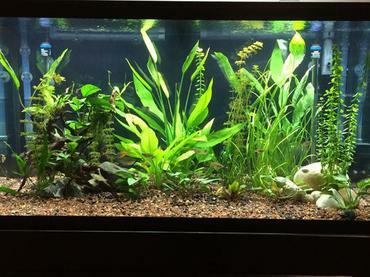 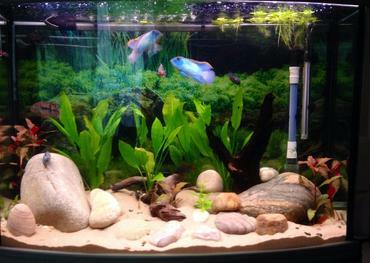 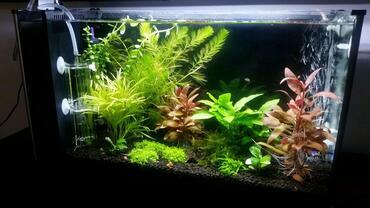 Another simple way to up the oxygen concentration in your water is to add live plants to your tank. 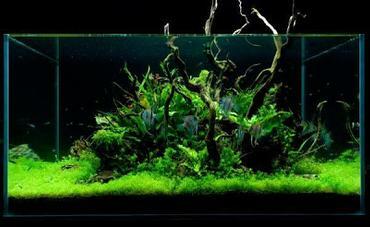 Like aquarium fish, plants go through the process of cellular respiration, converting carbon dioxide into oxygen that is available for breathing. 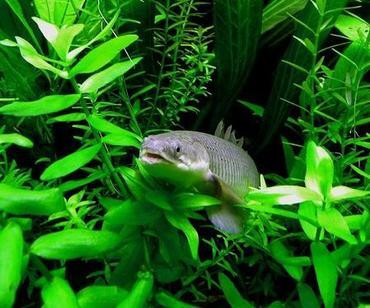 An interesting fact about having live plants in your tank is that while your fish may die from lack of oxygen, your plants could die from lack of carbon dioxide. 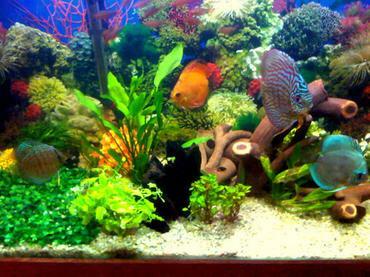 This makes live plants and aquarium fish the perfect duo – they provide what the other needs to survive. 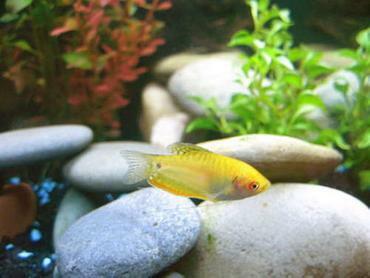 Having live plants in your tank while providing adequate circulation and aeration for your fish can be tricky. 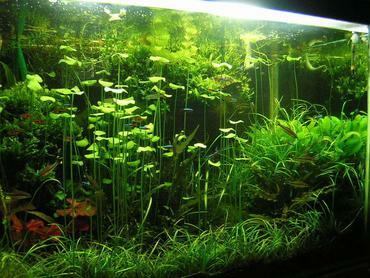 Aquarium plants tend to do best in tanks with low water flow because they may be uprooted by water that moves too quickly. 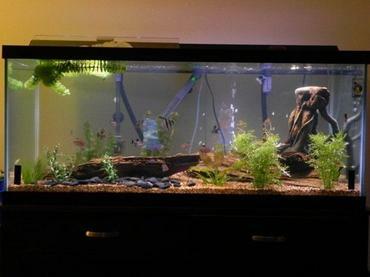 To deal with this problem, make sure your plants aren’t situated directly beneath the release flow of your filter and place them away from other aeration devices. 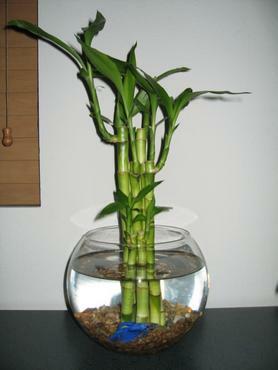 You should also avoid placing plants too near your water heater because it could damage them. 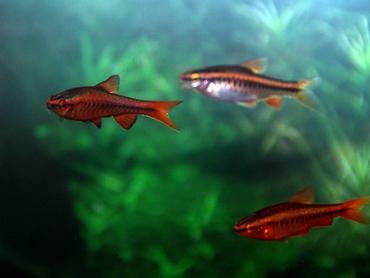 While many factors play a role in keeping your fish healthy, aeration is one of the most important. 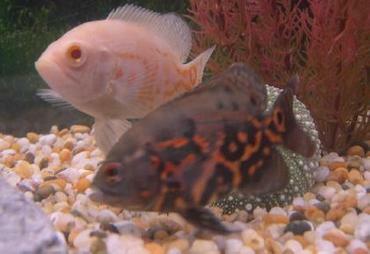 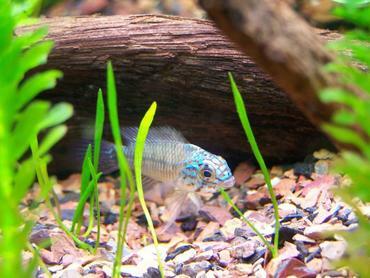 Properly aerating your aquarium allows your fish to breathe properly, which is essential for good health. 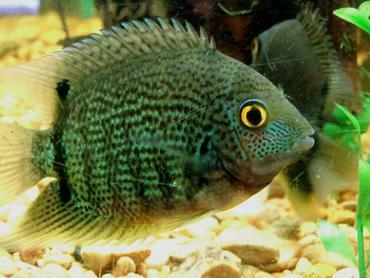 The devices most commonly used to increase aeration in fish tanks are filters, power heads, air stones, and aerating decorations. 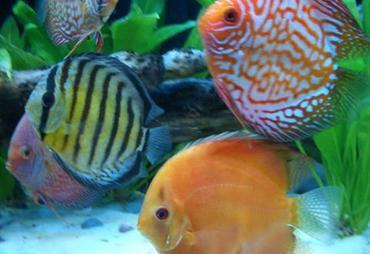 Use whatever combination you like to provide your fish with the oxygen they require.